What is a Wading Staff? Shuffling your feet waist deep in a river, trying to keep from slipping into cold water and being pulled downstream by the swift current. This is a familiar scenario for anglers who spend their time chasing fish in streams and rivers. Wouldn’t it be nice to be able to move across slippery river bottoms easier and more safely? The simple solution is a wading staff. A wading staff serves as an effective tool to keep you safe and reduce the risk of injury on the water. A wading staff is more or less a well thought out walking stick. While any old stick could help you cross a river, having a dedicated and packable tool to do the job will ensure you are always safe and reduces your risk of slipping. Typically, they are designed for fly-fishing are collapsible in some way or another, allowing them to pack away or clip to your vest. It is an invaluable tool to have in your fishing gear arsenal, here are just a few of the benefits. ​When walking in streams or rivers, the view of your feet is often obscured, rocks are irregular and slick, and having two points of contact with the ground at all times is key. Without a wading staff, you are left with only one balance point (grounded foot) at a time. Either that or a painlessly slow shuffle. When both hiking and wading in the stream, a wading or hiking staff will reduce fatigue. It will allow your arms to take some of the power required for moving. Additionally, the increase in balance will reduce fatigue on your core and balance muscles. In some water conditions, you may not be able to see where you are putting your feet or what is in front of you at all. Having a wading staff will allow you to poke and prod ahead to see what is next. You don’t want to inadvertently step over a drop-off or into a root wad. 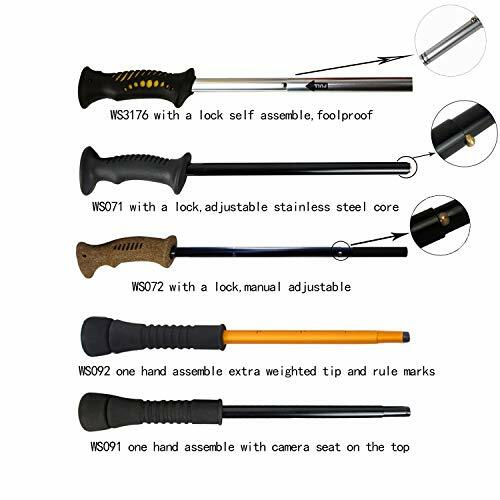 While all wading staffs are more or less a hiking stick, there are some differences among them. Your ideal wading staff is going to be able to break down to a smaller size. You don’t want to be lugging around a long stick while fly fishing. For breaking down into a smaller size, there are generally two mechanisms. Telescopic styles, like a hiking pole or tripod, are sturdier and more versatile. They allow for finer height adjustments and can be used as a serious trekking pole for hiking as well. The downside is that they take longer to set up and can be bulkier/heavier. A folding style is much more packable and ultra-convenient. This is also the most prevalent in dedicated wading staffs. They piece together like a tent pole with a bungee inside. This makes for an ultra-quick and easy setup when you need a little extra balance. They are also lightweight and can slide in a pocket or strap onto just about anything. The downside is that they are not always height adjustable and they can’t really be used a serious hiking pole. These are for an angler just looking for a little extra stability out in the water as needed. Wrist Straps not only help to ensure you don’t inadvertently lose your staff in the current but also serve an ergonomic purpose if you will be using it as a trekking (hiking) pole. This is something that any good option should feature. Now that we have covered the basics, let's see which wading staffs made our list! A Functional Storage Pouch was not an afterthought. FishPond designed a pouch with care and intent to make it functional and easy to use out on the water. Strapping it to your body or pack within arm’s reach ensures stability is only a quick grab away. Hybrid Design allows for the quick convenience of a folding staff with more sturdy features of a telescopic pole. Despite folding into three pieces, this staff has the ability to lock securely together in full length and features a top section that is adjustable to fine tune to your height. A Little Less Packable than some of the slimmer profile dedicated wading staffs. With the extra features required to be a respectable trekking pole overland, there are a few bulkier additions, such as the adjustable cam-lock and contoured grip. FishPond has become a big name recently in the fly-fishing world as a company producing quality gear and innovative ideas for moderate prices. The Lost Trail Wading Staff is no exception to this and FishPond has done an excellent job constructing a great all-around pole with anglers who hike miles over the ground in mind. It quickly folds down into three sections for quick and easy use and transport. An excellent feature of this particular one is that the folding sections are able to actually lock together with a quick and easy adjustable locking mechanism. Despite being a quick folding design, this also features a telescopic section for fine adjusting the height. 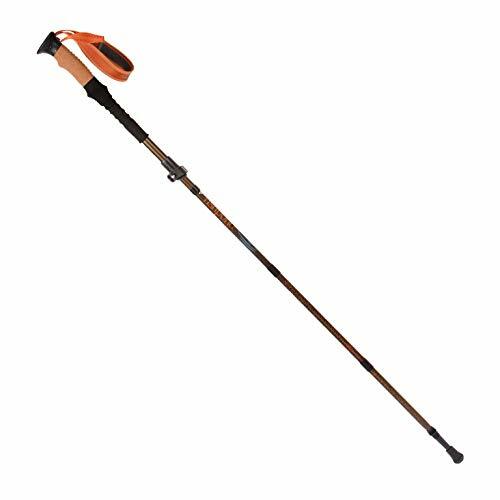 The cork grip and padded nylon wrist strap aid in making this an excellent, all-around trekking pole and wading staff. Coupled with the light design and height adjustment, you can fine-tune this staff to serve your needs both in the stream bottom and in covering miles overland to get to a remote trout stream. This model includes a well-designed and functional storage pouch. It quickly slides in and out of this pouch and it features two types of attachment points on the pack to secure to your pack, vest, or belt. It is easy to see why this is at the top of our list. FishPond put some care and thought into designing an all-purpose model. While it definitely emphasizes features looked for by anglers, it is built to near the same specs as a dedicated trekking pole. Despite being one of the highest quality builds and our top pick, it still comes in at an affordable price point. The Included Leash helps to secure your wading staff onto your body in the event you drop it in the current. While it is easy to rig up a leash for a trekking pole, for the budget price of this one, it is a great added feature. Quick Setup - The bungee collapsible design of this staff makes setup and takedown a breeze. Thankfully, this staff could still be used as a moderate trekking pole on dry ground. Reducing down to 12” and constructed of lightweight aluminum, it is easy to stash away on a pack, vest, or belt within arm’s reach. Non-Adjustable Height restricts this trekking pole to a good general height of 51 inches. However, this may be an incorrect size for some users and this one is offered in only one size. This collapsible wading staff by Hammers maintains a familiar but effective design similar to other similar models. It features a quick-setup bungee collapsible design that quickly folds down to 12 inches, so easy it can be assembled one-handed. The staff is made out of lightweight, aluminum alloy tubes that maintain sturdiness while reducing weight. The wrist strap makes serious hiking with this staff possible and the clip-on leash ensures you don’t lose your staff to the current. The durable carbine tip helps the staff dig into terrain and gives you a proper footing and balance point. It has a full length of 51 inches, a collapsed length of 12”, and a weight of 11 oz. A good value option at great budget-minded price makes this one our runner up. The excellent price for what you are getting is one of the reasons this is our runner-up. For a moderate, budget-minded price, you are getting a near full-featured wading staff. Lightweight, with a quick setup, and the ability to hike with it make this a high-value option for your fishing endeavors. Depth Markers on the aluminum poles allow you to quickly assess and read depth of the water in front of you. While not necessary, it is a nice feature to have for the price. A Carrying Case is included with the staff and features straps on the back to mount to a variety of things. It is nice to be able to keep your staff within arm’s reach for balancing at a moment’s notice. The Quick and Easy Folding Design allows the four-pieces to break down for quick assembly, even one-handed. This can be important for some people in case you find yourself in a situation where you need extra balance quickly. The Non-Adjustable height can be a big drawback for some. This staff is fixed at 55 inches in length, too long for some. For not a whole lot more money, you can get a staff that features some adjustment and may have a variety of other additions. Another affordable and lightweight option, Aventik has designed a quick and easy to use folding wading staff for the budget-minded angler. The four-piece folding design allows for quick one-handed operation thanks to the shock-cord bungee inside. The aluminum construction of this staff keeps it corrosion-resistant, lightweight and durable for the use ahead. At the tip of the staff is a tungsten point to allow for durability and grip in varied terrain. The staff also features a slide-on rubber point for other hiking scenarios. For hiking, the staff features an ergonomic handle and webbing grip. 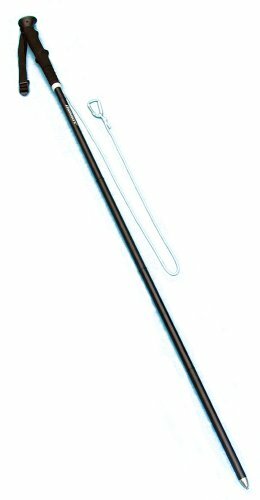 The expanded length of this staff is fixed at 55 inches and folds down to 12 inches. The staff comes in around 11 ounces. Coming in at a good, mid-range price in our reviews, this staff has the features any middle ground product should. While this staff can be used for some light hiking, it is better used as a dedicated staff. Its quick assembly, lightweight design, and fixed length make it a convenient tool to have for balancing in a body of water. Compact Six-Piece breakdown folding design makes it compact at under 10 inches when folded. The inner bungee cord allows for it to quickly be assembled, even one-handed. Multiple Sizes allow users to go for the simplicity and elegance of a fixed length staff without fumbling with an awkwardly-sized staff. Folstaf makes this one in 41”, 51” and 59” lengths. As the Priciest Option on this list, this model is out of the hands of some. The classic design comes with a big name that you pay for. Not a Great Hiking Option. Folstaf was the first on the market to feature a dedicated wading staff. As such, they didn’t include many features of traditional hiking poles in order to set themselves apart. While this makes an absolutely excellent option, it is not a great option as a dual purpose trekking pole for hiking over the ground. From the company that brought the name and purpose of a wading staff to the masses, the Original Folstaf Wading staff is still based on the simple, yet effective, original design with some modern updates. This folding staff folds down into an ultra-compact, 10 inches thanks to its six-piece breakdown. The inner bungee allows for easy one-handed assembly. The shaft is made from durable ¾ inches aircraft grade aluminum and has been standing the rigors for years, as the first wading staff on the market. The Folstaf wading staff features lightweight and attractive cork grips along with a leash to keep the staff secured to your body. The nylon carrying case allows you to mount it somewhere within arm’s reach. This is a fixed length available in lengths of 41”, 51”, and an extra long 59” version. At under 15 ounces and less than 10 inches collapsible, it is a very portable and easy to carry design. Folstaf continues to produce the wading staff that started it all. Up until this design was released, the only options were fixed length hiking/ski poles or some of the newer adjustable hiking poles. Folstaf set the bar by making a quick and easy-to-use design that is easy to carry on the river. The modern and updated version of this original design carries the same heritage and ultra-convenient features designed for on-foot anglers in the water. The Leash and Carrying case serve the purpose of not only making sure you don’t lose your wading staff, but also that it is within arm’s reach when you really need it. Slim Design features a straight aluminum break-down shaft and straight cork grip. This allows for the staff to breakdown into its carrying case and easily be able to slide in and out of whatever. Not Budget-Minded. This is an example of paying for another well-known name. Like Folstaf, Orvis has developed quite a reputation for quality. While this staff is certainly above many others on our list, for the price, I would personally like to see more features to make it a versatile hiking pole as well. Last, but certainly not least, is the Orvis Sure Step Wading Staff coming in as our top-rated dedicated fly fishing options. Based on the original and timeless design of the Folstaf wading staff, the Sure Step features additions and modifications that enhance the usability. The folding break-down design makes this slim design easy to carry on the river. The bungee cord allows for quick assembly and takedown, after which you can slide it effortlessly into the included carrying case. The cork handle on top of the aluminum shafting is lightweight and attractive. Like the Folstaf, it features a straight cylindrical design, not the contoured style found on hiking poles and other staffs in this review. While not great for overland hiking, it is uniquely suited for the water and is much simpler and packs down easier. The Sure Step Folding Wading Staff by Orvis comes in fixed lengths of 51” and 59”. This wading staff also includes a carrying case and leash lanyard. Orvis did an excellent job in designing the Sure Step to be a functional, attractive, and packable wading staff. The sleek design not only looks good but is helpful when packing or trying to remove the staff quickly. This would be an excellent addition to the angler who just wants the assurance of having a wading staff for balance at arm’s reach on occasions as needed. Who knew there was so much to say about wading staffs? While trekking poles and wading staffs may have formerly been a “faux pas” to some, the masses are realizing the benefits of such tools in the outdoors. Serving multiple purposes from reducing injury risk, reducing muscle fatigue, and increasing hiking ability, people are starting to catch on to the benefits of this versatile tool. Walking on slick river bottoms can be a dangerous affair no matter the person. Having an extra point of contact on the ground makes things significantly safer and may serve to keep you out fishing even longer. If a wading staff isn’t part of your collection and you spend lots of time in streams and rivers, then it may be a worthwhile investment.